To become a patient please fill out the Medical Intake Form for a wellness consultation which is included in the cost of your medication. Established patients may refill their order. Glutathione Injections from The HCG Institute are made in the USA at partner 503B compounding pharmacies and can only be administered via medical supervision and a prescription. Glutathione is considered the body's first line of defense against oxidative stress and a number of toxins which are constantly attacking our cells and enzymes. Requires overnight shipping and must be refrigerated upon arrival. 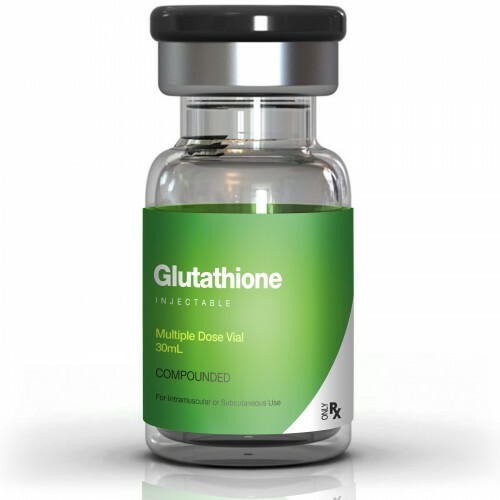 Glutathione Injections also known as gamma-glutamylcysteinylglycine or GSH is a tri-peptide or a small protein molecule formed from three amino acids; cysteine, glycine and glutamic acid. Glutathione Injections are a water-soluble antioxidant, a detoxifier. It plays a key role in the support of the immune system. It is found in the largest concentrations in the liver. Glutathione Injections are considered the body's first line of defense against oxidative stress and a number of toxins which are constantly attacking our cells and enzymes. As glutathione levels decrease supplementation via Injections becomes necessary. However, research shows taking glutathione itself orally does not boost cellular glutathione levels since it breaks down in the digestive tract before it reaches the cells. The only truly effective form to increase active levels in the body is with glutathione injections. Refrigerate upon arrival.